Definition at line 20 of file Note.h. Definition at line 23 of file Note.h. Reimplemented from ACLStrategy< NotePairs::Entry *>. Definition at line 19 of file Note.cc. References delimiters, and Acl::TypedOption< Recipient >::linkWith(). Reimplemented in ACLNoteStrategy, ACLAnnotateTransactionStrategy, and ACLAnnotateClientStrategy. Definition at line 27 of file Note.h. 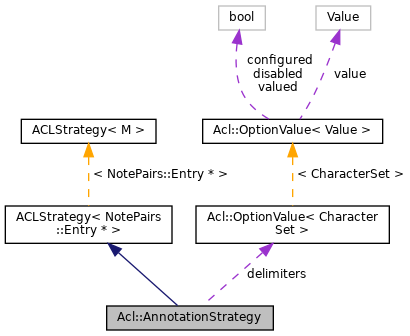 Referenced by ACLAnnotateTransactionStrategy::match(), ACLAnnotateClientStrategy::match(), ACLNoteStrategy::matchNotes(), and options().